The celebration and preparations for 26 January Republic day has started once again. 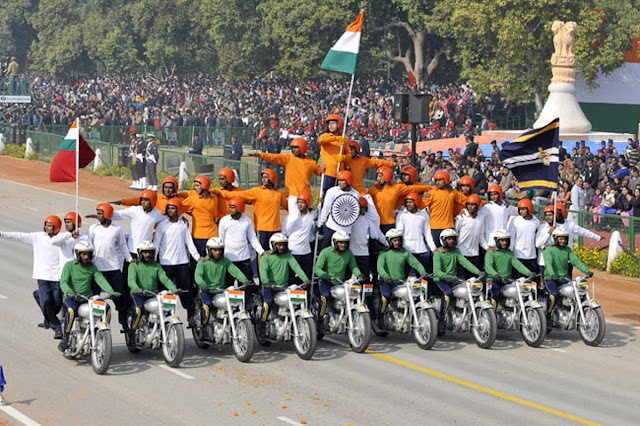 You can book tickets online for Republic Day Parade event in New Delhi. The official online ticket booking for Republic day Parade 2019 is made available and the same can be booked for Beating Retreat Ceremony as well. Regarding how to get tickets online, the list of official centers and websites have been mentioned below for your reference. The ticket prices and their availability may change accordingly as per seats reserved for various people during the event. All those who are interested to buy tickets online for Republic Day Parade 2019 at Rajpath event and Republic Day Rehearsals event can get them from official stores in New Delhi or else book the same from here. The links for ticket booking has been allotted by Government of India. The Republic Day Bravery Awards for 2019 parade event will be followed after Jhanki Tableaux display of various states culture. Please take a look at the grand celebration itinerary for the event and various function that has been planned during the 70th R-Day celebrations at the Rajpath, New Delhi as PM Shri Narendra Modi makes way for a grand occasion for our pride of the nation! The Government of India has already announced that Republic day celebrations will be happening with full honour and respect upon various delegations served by PM of India. Current Update: As per Government offices based in New Delhi and Rajpath regions, almost 70 percent tickets are sold between public online and across different stores in New Delhi. This includes data of about 40 percent sale in online ticket buying at the office. The ONLINE TICKET SALES for Republic Day Parade is in full swing!! As per official sources - Doordarshan TV and media speculations, this time Prime Minister Shri Narendra Modi will accompany the sovereign of Jawans who had battled hard in Jammu Kashmir and also for those soldiers who lost their lives battling for the nation. There will be special ceremony to pay national respect to all those family members in form of a parade by Military leaders. The march and salute of Indian Soldiers - Our Heroes of the nation! We will also witness the occasion of Naval troops leading the new march of success as a part of their success initiative. In a recent news confirmation from India Today, the Prime Minister will accompany the South African President - Cyril Ramaphosa after he confirmed his presence at the recent G-20 summit at Argentina. There will be balloons organized at the edge of the streets during the Republic Day rehearsals which generally happens in January 24. The Republic of India will be proud to host the Nation's biggest showdown in form of parade when all three units - Air Force, Navy and Armed Forces march forward to showcase the biggest pride of our nation - India! The Government of India has imposed a new update wherein people across the country can buy tickets online and come to witness the historic celebration of Republic Day Parade on the occasion of PM Shri Narendra Modi addressing the public. We have mentioned the ticket prices below in our article, however the Government agencies confirm that ticketing partners like Paytm and BookMyShow will honour the facility of ticket booking online. There will be a need to show the official Government Citizenship ID proof while procuring these tickets. There's going to be number of events that will be happening that day in presence of India's PM, President of India and with the Chief Guest. The Government has decided to display cultural and democratic India with students showcasing different flavours of each and every state. This year, South African President - Cyril Ramaphosa is being invited as the Chief Guest of Republic day celebrations to accompany India's PM and President at the Rajpath. After the flag hoisting, special Republic day parade begins which is the most loved and highlighted event in the entire celebration. All three strengths of India - Indian Army, Navy and the Air Force give their salute by marching past the President's Box along the India Gate. They march from the India Gate, along the Rajpath to Vijay Chowk for with colourful regiments from all sectors of India. Special awards for exceptional performances in Bravery are awarded to eligible students. Civilians having high honour in armed forces are also awarded with Ashok Chakra and Kirti Chakra on notable lines. Then special state wise representation of cultural dance from students of various schools take place at the venue. You will also get to see Jhanki's of various states commonly referred as Floats where they depict each state's cultural richness in regards to their living style. All states have a different symbolic meaning and various artists perform those to show the actual meaning of each state. Following that, towards the end, the Border Security Forces (BSF) professionals show stunts on their motorcycle hurling flags of India. They symbolically show the Republic day celebration in their unique stunt show. The final showdown really embarks the uniqueness with Indian Air Force spread the tri-colour in the sky when they fly past in a pattern of groups. This in itself give rise to national glory and honour of respect for them. If you are looking forward to the grand festive event that has everything in it for a national feeling, you should go ahead and buy the much awaited tickets for the event. If you are non-localite, prefer buying tickets online once sale commences for the same. But if you are a localite of Delhi, go to some non departmental or departmental counters where you will get tickets at a reasonable price. For Beating Retreat ceremony: 27th January, 2019 - 28th January, 2019 :: Timing from morning 10:00 AM and open till evening 4:30 PM. These are by far the official places to get tickets for parade event celebration in Rajpath, New Delhi. Regarding online tickets availability for Republic Day 2019 event, the sale has already started and you can book through the official links available. A lot of speculations has recently occurred in regards to ticket prices for the event. We would like to alert you of fraud people indulging in ticket sales for the event. Only people who have a valid photo id card are eligible to avail tickets for the event. Government has gone strict with full measures to protect fraudulent activities involved in ticketing. Therefore all departmental and non-departmental stores have made it mandatory to show Government Photo ID cards while buying them. These are the valid proofs which are eligible for buying tickets for R-Day celebration on 26th January, 2016. We have few free tickets available for interested people who might want to visit the venue for Parade celebration event at Rajpath. If you want to avail the free tickets for you and your family, all you have to do is share the article and comment with your views as a response to this article. We will ensure the best participant wins at the end of the contest! We will deliver the free tickets at their address through an email communication. The celebrations at Rajpath, New Delhi is felicitated by member of honour and respect given to each state when they march past showing culture and sections of people living within the society. There are also huge guard of honour shown for military section - Army, Navy and Air Force team when they perform at the parade ceremony. The Chief Guest of Honour enjoys the moment of pleasure with PM of India - Shri Narendra Modi as they salute the army merchants and nuclear power possession of India towards national glory. It is a huge pride and respect for people who sits and watch the ceremony come alive at the event of national honour. We would be extremely glad if you can let us know your interest for coming at the Republic Day parade event on 26th January, 2019 at New Delhi. You can comment below with your details like name and email so that we can contact you at the earliest for free tickets. PM of India has stated that this special event will also be open for few people who are eligible for free passes directly. After the Republic Day Parade is completed for all three wings of the Indian Army, Prime Minister Shri Narendra Modi will present the Bravery Awards to the eligible young heroes of the nation. This is a very special award recognized by the Government of India and is present after rigorous selection of courage acts performed during the entire last in different states. After felicitating the Bravery Awards, Cultural Dance event is performed by the students of Kendriya Vidhyalaya, New Delhi region. Every year the tradition is followed and showcased some of the best dance acts of different regions all together showcasing the diverse culture of mother India. The performance is specially choreographed by India masters and the training for such Dance acts as per regional diverse culture is performed by different students of Delhi region. In the coming celebration of 26 January - Republic Day Event in New Delhi, people can witness a cultural parade dance festival to be performed by Government college students in the state. This prolific dance theme has been organized keeping in mind the different languages and traditions followed by each state in the parade. On the occasion of organizing this special dance with parade after the military show, it would give the Chief Guest immense pleasure to celebrate the occasion of national festivity with full colors and joy. A day before the Republic day parade action begins, President of India - Shri Ramnath Kovind will deliver a speech stating what is the current economic scenario across the country and will advise on improvising the current situation on country specific issues. Regarding political interest, there will not be any discussion regarding the battle of the parties before the Loksabha elections, however an advise would definitely come in regards to all of us voting for the elections! This speech will be hosted by Doordarshan TV in association with Cabinet of Ministry broadcasting this special speech episode. I want 3 tickets. Can you please help? We are really glad to announce that Republic Day celebration Tickets are open for Indian citizens as per announcement by Government of India. If you are interested to buy tickets at reasonable cost directly from the stores of New Delhi - Please comment below with your details. Sir I need 4 tickets .How can I get them? Guys I need three tickets. Reserved seat. Please mail me at getganesh.online@gmail.com if you have any. And please make it fast. I need two tickets.Is it possible to get it from your end. Everybody listen importation provode in this is totally fake . From last two years prices had been changed . Pls don't contact to these people they are fake and cheaters . So pls don't contact them. There is no way to buy tickets online. Sir I need 4 student tickets... Please help me out..
How can I book the tickets online? Can you please share the website ? There is no website to book ticket online. Government of India will start the initiative of online tickets because of cashless economy situation right now. All you need to have is a specified Bank account and valid identity proof to generate the ticket. Which is the site to book online. If no online tickets are available how can outsiders get the tickets? I would like to welcome you for Republic Day Parade event here in New Delhi. Glad to know, you are from Kochi! First of all after cashless economy, yes the Government has rolled out the online tickets for Republic Day Parade event. Currently our PM - Shri Narendra Modi has given the pilot project to our team for facilitating tickets are cheaper rates as compared to previous years. Do let us know your interest for the same. I need two reserved category tickets please , I am from Mumbai. I need 2 tickets for the Republic Day Parade event. Can you please help? There is no way for online booking and he is fake. He don't know anything. this is very valuable article for whom to attend the 26 th January parade. Thank You for letting us know your thoughts! Do let us know if you are willing to visit Rajpath, New Delhi this coming Republic Day! can you please let me know the website for online tickets forthis Republic day parade. ..I m from Mumbai. .
Really appeciate the fact of supporting your parents! Yes watching the address of our PM - Shri Narendra Modi live along with glorifying parade event makes for a dream event. Are you currently here in New Delhi? If not, do let us know - we will arrange online ticket booking facility. If you are based here in Delhi, then collect your tickets by visiting our store at any time. I need 3 tickets. I am from Gujarat. Can you help me with your number. You can reach me at 9650033131. I want 1 online ticket, could you please arrange? It's indeed a moment of pride and joy to watch and be part of the celebration. Me and family will be going for the first time and its our pilgrimage and homage to our great nation. Jai hind. Lastly thanks you very much for sharing details information regarding the celebration. Indeed I feel proud to see our Mother Nation standing to salute the leaders every year! It's going to be a fascinating Republic Day event for sure and this year under the Government of India - I and my team are trying my level best to get tickets for all the audiences who are willing to come! Do let us know your thoughts of visiting the event that day, we will arrange something. Hi, I stay in Mumbai and wish to attend republic day on 26th January,2017 and I do not travel to Delhi any often so wish to get the tickets online for reserved seats. Please let me know how to book online. As I will be coming on 26th morning I won't be able to go to the places to get my ticket. Please advice me. Hello, I am Ritu from Assam too. Please tell me how can I get a pass/ticket for republic day parade 2017. Is it possible to book a pass from here(Assam)? Welcome to the Parade event of Republic Day Celebration in New Delhi. I understand the fact that Assam has several restrictions laid down on national holiday and they have fear of coming out from their house, but trust me this is a moment to enjoy once in a lifetime. anybody can tell me what is reserved and unreserved tickets?? Thanks for letting us know your question. Yes unreserved tickets means you are allowed to enter the event, but no seats for you. You will be watching the entire event standing in the crowd. Reserved seats means getting the seat number officially and watching the event peacefully from your place. What is the relaxation in the reserved seats ticket price for students?? The relaxation is not mentioned. It will depend upon the number of students and school association with Parade event. The price of tickets per student is Rs.10/- as per Government of India. whats the site for online? Thanks Louis for your appreciation! Do let us know if you are attending the event coming January. Can I get 2 Tkts for tomorrow? Thank You for encouraging us! Do let us know if you need any help in regards to coming for Parade event here in New Delhi. If there is no site for online ticket booking, why do the article written here mentions it? its misleading. The cashless economy and Digitalization is the promotion for this year's online sale of Republic Day Parade Tickets. The Government knows the situation across the country and therefore they are eager to promote sale of tickets for any citizen who lives within the country from any place apart from New Delhi. You can book online tickets from anywhere across India without any extra charges. you haven't replied to any of the questions asking where to buy online..if you know where to buy online ticket do share the link,else dont misguide people. pls call me at +919717022984 asap if u have republic day parade tickets. Can I have the tickets please, Please share your number.. Welcome to Republic Day Parade event on 26 January. Are you based in New Delhi right now or outside? If you are residing in any other state, please let me know. Otherwise I can arrange easily from the Government office upon permission. Hello I am german. Is there any chance getting a pass for the parade. Would like to see. Can anyone help? Yes there is a very good chance for come in and see the parade event here in New Delhi. Are you currently living here in India? I guess it would be quite tough for you to come down and stay for few days before heading back to Germany. Do let me know if you need help in regards to Ticket booking for 26th January. Thanks! hello sir.My self Shah Shivangi. I am from ahmedabad,Gujrat.I am engineer student.I want to book 2 student passes online but there is no any site I found to book so how can i attend this event. I am eagerly waiting for this parade.so plz give me guidance n help me out that how can i get passes n take part this grand festival of India. Hi, I would like to send a group of students to witness this programme. How do I book tickets on line?? I would like to let you know that schools that are based in New Delhi are only permitted for attending the event. The tickets for each student shall stand only Rs.20/- per head. I would really like to take forward and keep the passes for you. If your students are out of New Delhi - I can check with Government if they are allowing at the event or not. And there will be no change in ticket rates. Guys tell me how to get Tickets , I am from ahmednagar maharashtra. Can my friend take tickets in my name?? Hello, I am Sandip. Can you please share the web address for booking online pass? Hi, I am from Mumbai and much interested in attending the parade. Please let me know how I can book the tickets online. Hi i am from Bangalore...I am interested in attending the parade...Pls do let me know how to book online tickets..
for visit Vidhansabha. what requirments are there? plz tell me. This article is very helpful in helping me giving the details how i can obtain tickets.but i am in delhi but my family is in back ap.so if i want tickets for them i had to have even their id cards or can i get tickets for my family on my id itself?can u plz kindly help me. I like to show my parents the parade it is a long time wish of my dad to attend one.so can u please kindly guide me..
Is there any website to book tickets online? Hi. We are family of 4 people from Chattisgarh interested in coming over to attend republic day celebrations in New Delhi. How can we get tickets online or can somebody help us procure the same? sir how can i book parade ceremony for my family . How can win the ticket by submitting the article ? What's the procedure n requirement! N any last date of submission? I want 2 tickets .Can anyone help in it? Appreciate the content of the link - but can someone really mention the link/website to buy tickets online - There are nice things being said but which link to use to book tickets online? My name is Lalit and I wanna buy 2 reserved tickets any body can help me. I Want 3 Ticket. Can anyone help ? I Want 3 Reserved set ticket. Can anyone help ? How to book online ticket ? 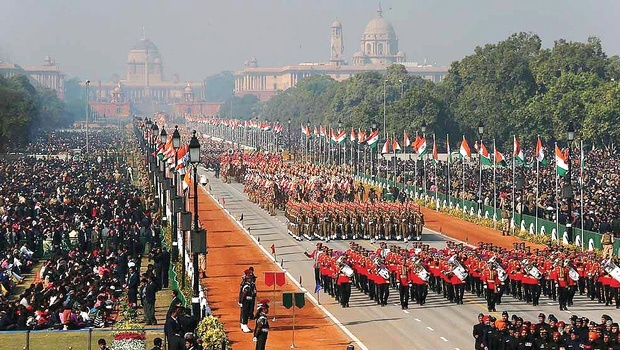 Watch the Republic Day Parade live at Rajpath, guided by the ex-servicemen of the Defence Forces! I'm from Mumbai and require 2 reserved tickets. Previous year Unreserved Ticket price was Rs. 20. But current year it is Rs. 150. Whats the matter? Today i visited the barakhamba road counter today , 11th jan 2016 and they informed me No tickets at DTDC counter at barakhamba road this year . what is the online website link..
Me name is Aakash, I want 3 reserved seats. Please help . Hi , we are a group of 4 coming from Europe and would like to know how to obtain vip passes for the parade on 26th Morning. we are require two passes for parade of 26th January 2017.
we are student of m.tech and b.arch live in delhi. I am unable to find the link from where I can purchase online tickets for republic day. Nice information. My son Parth Bansal, 14 yrs, got President award for innovation(Ignite award 2016). I wish to attend Republic Day parade along with Parth and wife. Can you help me to fulfill my long cherished dream? One thing came to mind that all the IGNITE awardees should also be part of RDay parade like Bravery award winners. This will boost of their morale and inspiration to others. My contact no is 9839974683. Hey! We are Delhi university students. We need 5 tickets. Can u please get it? Hey... I am from Himachal Pradesh and interested in witnessing Republic Day parade. Can any one help me in getting 3 tickets(reserved). Any pointers please mail me on vineetkishore92@gmail.com. Thanks in advance. Hi, I need 6 tickets. Please provide the link or site name to book the same. In order to facilitate the general public to witness the Republic Day Parade at Rajpath and Full Dress Rehearsal of Beating the Retreat Ceremony at Vijay Chowk, the sale of tickets had commenced on 07 January 2017. The price of tickets for the Republic Day Parade on 26th January 2017 are Rs. 500/- for reserved seats and Rs. 100/- and Rs. 20/- for unreserved seats. The tickets for the Beating the Retreat Ceremony (Full Dress Rehearsal) on 28th January 2017 are in the category of Rs. 50/- and Rs. 20/- and does not have reserved seats. Tickets are available at seven Departmental Sale Counters. These counters are located at North Block round about, Pragati Maidan (Gate No. 1), Jantar Mantar (Main Gate), Shastri Bhawan (near Gate No. 3), India Gate (near Jamnagar House), Red Fort (near police picket) and Sena Bhavan (Gate No. 2). For Members of Parliament, a special counter has also been set up in Parliament House (Reception Office). The above sale counters are open till January 25, 2017 from 1000hrs to 1230 hrs and 1400hrs to 1630hrs. In regard to the Full Dress Rehearsal of Beating the Retreat Ceremony the tickets will also be available on 27th and 28th January 2017 from 1000hrs to 1630hrs. However, on 28 January 2017 the counters will close by 1500hrs due to commencement of Beating the Retreat (Rehearsals). From 23 to 25 January 2017, ticket counters of Sena Bhawan, Jantar Mantar, India Gate and Shastri Bhawan will remain open till 1900hrs. No ticket counters will remain open on 26 January 2017, the day being the Republic Day. The tickets are sold on the basis of production of Aadhaar Card, Voter Card or Identity Cards issued by Government of India or State Governments only. Payment for tickets will also be accepted by Credit/Debit Cards. Me too from pune and now in delgi for UPSC preparation .today i have purchased tickets.Is great to be there. You can purchase it very easily from TU TU ROAD on Rajaji marg. Metro is available till Racecourse (Lok kalyan marg) and from tgere you have to walk 1.5km. Contact me for further information regarding route. i need 1 reserved ticket. plz help me. I need reserved 5 tickets, kindly share ur details here. Me and friends are planning to see live parade. If possible could you please let us know from where we can book tickets for the same. We are also interested in watching beating retreat ceremony. We want to see any one of them. Can anyone help me with 3 tickets. CAn anyone help me with 3 tickets . Is there any online site to register for this event ?? Hello I want to come in the Republic day prade can i book tikets today. Can i still get the tickets for tomorrow..
Bhai jisko bhi tickets sale karna ho plzz mujhe de do plzz.. Need 3 or 2 tickets/passes for Beating Retreat Ceremony on 29th Jan 2017. Please reach out to 9911976106 if anyone can provide confirm tickets. One can get the Best author books for the Gate Exam Preparation which is one of the essential part of Gate Preparation. sab chutiya bana rhe hain, link koi nhi bata rha h.
Hi, I need two reserved tickets for republic day parade 2018. Hello, i need three reserved tickets but cant buy it from outlets, is there any way to book tickets online? In reality, there is no option for online ticket booking / purchasing. I need 2 tickets , me and my friend both are college students .. Arrange the tickets for us , and let me know the amount, and where to collect from .